Whenever we have a meeting the table is always shaking. John seems unable to stop his leg from jittering. Mary never puts her coffee cup away after she washes it. She leaves it on the sink for someone else to put it away. It’s so annoying! Hun mumbles every time he speaks. I really can’t understand him. I wish he’d speak more clearly. Every Monday morning Janet wants to tell me about the weekend achievements and dramas of her three children. When will she understand that I’m really not that interested! No doubt you have these thoughts and feelings from time to time about your colleagues. Working with and getting along with other people is not always easy. Sometimes it is downright difficult. In fact, sometime these annoying behaviours can really drive you crazy! Your challenge is when these little things become your focus. After a while it is all that you can see these people doing and that means that eventually you see the person as being 100% annoying. When this happens it is difficult to stay a high performing team. Group dynamics have a direct impact on team performance and your attitude toward your colleagues impacts team dynamics. What can you do if you find yourself in this situation? Success Magazine founder and editor Darren Hardy has a suggestion for your personal relationships when they start to become annoying and his strategy is just as useful for workplace relationships. Use a notebook and write your colleague’s name at the top of the notebook. Each day for a month find something good about that person to write in your notebook. Train yourself to see the good things they do. Your list can contain work tasks that they do well or other contributions that they may be making around the office. As you add notes to your list, run your eye over the entire list. Soon their ‘annoying’ behaviour won’t be all that you see when you look at this person. Your focus will have changed. Taking this action won’t change the person’s annoying behaviour. Rather, it will help you to see that they are not 100% bad. In fact you’ll likely see more good than you have ever previously noticed. Your new insights about them will change your behaviour toward them. They will react positively to your behaviour and your workplace relationship and dynamics will improve. Most importantly you’ll be able to continue to work as a high performing team. If you don’t believe that this strategy works then give it a go. My bet is that after only one week you will notice improvements in your workplace dynamics. The recent arrests here in Australia about alleged threats to randomly kidnap and publicly murder an Australian member of the public has certainly brought the reality of the conflict in the Middle East to our shores. The issues and problems involved are unbelievably complex. So complex that it is easy to feel like there is nothing you can do to improve world relations. I disagree. I believe that we can make a difference one person, one relationship at a time. And community sport is a terrific vehicle to make that difference. I have been involved in community sport for a long time. I have been a senior coach of Australian Rules Football in suburban Melbourne, I coach an Under 15 Boys cricket side for the Oakleigh Cricket Club and I have been heavily involved in assisting and supporting the coaches for my eldest son’s local junior football team. My four eldest children are all involved in sport including basketball, hockey, gymnastics, school aerobics, cricket and Australia Rules Football. The beauty of sport is that it brings people from different cultures together. This year we had three boys of the Muslim faith play in our premiership winning Under 14 football team. One of the boys is of Afghani decent and the other two boys are of Malaysian decent. They are three of the happiest boys I have ever had the pleasure to meet and are very popular with their team mates. Their families adhere to their faith and are wonderful people. It has been a pleasure to witness how the other boys in the team have supported their Muslim team mates throughout Ramadan. The boys play and have fun together. They are one. Their differences in faith is meaningless. They love and respect each other. This year we have a boy of Chinese decent joining our cricket club. He has never played cricket before and his family have never had anything to do with cricket. They are on a steep learning curve. But so are we. As they are learning about cricket culture we are learning about their culture. Everyone is winning and everyone is learning how to see each other as equal human beings irrespective of our religious and cultural differences. I remember when I was a senior football coach for the Monash Gryphons in the Victorian Amateur Football Association (VAFA). One of our team members was a student from Thailand and another was from Russia. Both boys were extremely popular because of their willingness to give our sport a go. But it was more than that. Everyone else at the club benefitted from Ott and Igor sharing their perspective on the world too. Once again we were all able to see each other as equals despite our differences. It seems to me that the capacity to randomly murder another human being is in part born in not being able to ‘see’ that person as an equal human being. Therefore, any activities, whether they be through sport or in classrooms at school and university, where we have the opportunity to build relationships with fellow human beings who are different to ourselves ought to be where we focus our energy. If we can’t build relationships and tolerate the differences of people within our own communities, how are we going to have any real impact on the world stage? The constant media reports that link people of the Muslim faith to terrorism have catalysed interesting conversations around our family dinner table. My children are friends with Muslims. They play sport together. My children know that their friends and families are not and will never be terrorists. My children express their concerns to me that only a very, very, very small number of Muslims are terrorists. They point out that people of other faiths are also terrorists. Despite the complexities of this topic I do feel more at ease when we have these family conversations. I am pleased that my children are friends with children of different faiths and different cultures. I am pleased that my children are exposed to their friends showing a commitment to their faith. It is the challenge to create a society where our differences are not a difference that gives me faith that we can make the world a better place. Community sport is the perfect vehicle to facilitate that reality. Gary Ryan will interview his guest Ian Harvey, Co-Founder of FutureFit Studios. Ian has been State Manager for one of Australia’s largest health club chains and has put his lifelong dream into action by sacrificing literally everything to create a new model for health clubs for the industry. In a bold move FutureFit’s membership system is not based purely on time or ongoing contracts. Instead the membership system is based on … you’ll have to join us to find out! Ian will also be sharing a further seven ‘Points of Difference’ that his new model contains compared to the existing Health Club offerings. Upon registration you have the opportunity to submit a question that you would like Gary to ask Ian during the webinar. If you are leading a business and want to know how to provide great service, then read on and learn how a team of volunteers from the Montrose Football Club who play in Division 1 of the Eastern Football league provided an experience that the USA Revolution will never forget. This story will teach you about the power of creating a shared vision, the preparedness to tap into the special skills that people bring to their work and the willingness to work with competitors to create a service that produced mutual benefits for all involved. What business wouldn’t like to learn these lessons! The AFL International Cup (AFLIC14) has recently concluded with Papua New Guinea defeating Ireland in an exciting and dramatic game at the Melbourne Cricket Ground. 18 countries competed over 13 days in both mens and women’s competitions. Every player had to be a citizen of their country so no ex-pat Australians were included in their teams. This was truly an international competition. In a stroke of genius the third round of the competition saw local teams throughout Melbourne host teams involved in the AFL International Cup, culminating in the Community Round where AFLIC14 games were held as the curtain raiser to the ‘main local game’. My twin brother Denis Ryan is both the President of USAFL and the mid-field coach for the USA Revolution (the men’s team). Montrose Football Club, who compete in the Eastern Football League were assigned as hosts for the USA Revolution. The “Revos” (as they call themselves) travelled to Montrose to train with them on Thursday 14th August before their game versus the New Zealand Hawks on Saturday 16th August. The USA Revolution squad, coaches and support staff were ‘blown away’ by the hospitality shown by Montrose Chairman Rob Ewart, Senior President Tony Eastwood and their dedicated Sub-Committee that was led by Rod Buncle and Terry Dean as well as their band of merry helpers. While the USA Revolution were hoping for a ‘good’ experience from the Community Round, what they received was better than any of them could have imagined. Like most success stories the real work started many months ago when the EFL sent out an expression of interest to all its clubs about applying to become a ‘host’ for one of the games. Senior Club President Tony Eastwood saw the opportunity as one that would enable Montrose to take significant steps toward bringing its vision of being, “Seen as a quality EFL Division 1 club” into reality. He immediately contacted his Blackburn Football Club counterpart and discussed the possibility of putting in a joint expression of interest with Montrose to host the USA Revolution and Blackburn to host the New Zealand Hawks. Leveraging the success of working together on the One Punch Cup the two clubs’ application to the EFL was accepted and the third round game of the AFLIC14 was scheduled to be played at Montrose. Terry Dean and Rod Buncle quickly formed a sub-committee to make sure that the day was a success. They worked with their team including Jenny McArdle, Kerry Schilling and members from the Montrose Coterie Group to make sure that the day was a special event for everyone. Using his corporate skills, Rod created a very detailed schedule of events that also included a link to the AFL’s vision for the community round. This ensured that everyone involved in hosting the event, which was upwards of 35 people, knew exactly what they had to do and when to do it. This is an example of letting good people use their talents and skills in the service of a vision that truly is shared. The Montrose and Blackburn Football clubs wanted to make sure that members from both teams had an experience that showed them what playing community football in Australia was really like. As a result of their research they became aware that the Revolution players rarely played at anything other than make-shift fields, and most often got changed out of the back of cars or in tents. In light of this understanding, Rod, Terry and their team went to extraordinary lengths to create the experience that the international players would never have imagined. They approached the EFL and requested that the football Record for the EFL 17th round be designed to feature the USA Revolution and New Zealand Hawks teams. The EFL accepted the request and ensured that both the cover of the record and the middle pages were dedicated to the AFLIC14 game. This is an example of ‘managing up’. Through Rod and Terry’s influence the EFL was able to see how they too would benefit from helping to showcase the AFLIC14 game (they also provided 250 extra copies of the record at no charge!). The Revolution squad members, coaches and support staff were all provided with a ‘showbag’ that included a membership to the Montrose Football Club, a miniature Montrose Football and a Montrose club cap. In addition, each locker in the changeroom was adorned with information about one of the USA players including their jumper number, name and other details. This information also adorned the walls of the social rooms. Rod and Terry explained that they had done this so that not only would the Revolution players feel at home (and have a real experience of having their name on a club locker), but it would also make it easier for the Montrose players, committee and supporters to engage with them and use their names. It is this level of thinking that drives high performance. To bother to find a way to help their own community to engage with the Revolution players on a personal level is exactly what high performing organisations do. A lasting memory for me is the image of the USA Revolution players leaving the field at the end of their game clapping the Montrose community as a sign of their appreciation for their support. In unison the Montrose community clapped them back. It was a pure moment that was about Australian Rules Football and the (now) international role that local clubs are playing in helping to take the game beyond Australian shores. More than 1,500 people attended the game including many local residents who hadn’t been to a game (This game would normally attract about 600 people). As an introduction to the club they could not have had a better experience. The term “win/win” is thrown around a lot these days but on this occasion the Montrose and Blackburn football clubs did themselves proud and could not have been better hosts for our international guests. This entire story was driven by volunteers, all of whom have busy lives. The success they created was because of the power of sharing a vision that was bigger than any person, allowing talented people to work together for the common good, and through understanding the expectations of the community they were serving and doing everything possible within their limited resources to exceed those expectations. No doubt a lot of hard work went in to hosting the event. No success comes without hard work. No doubt you work hard too. But you might not be getting the success you desire. If not, re-read this article and pick out the many lessons that will help you and your team achieve the type of excellence that the Montrose and Blackburn football clubs provided the USA Revolution and New Zealand Hawks Respectively. As an anecdote to this story several Revolution players have already commenced talks with Montrose to come out and play with them in 2015. Montrose views this as an opportunity to strengthen their ties with USAFL and are eager to build on their AFLIC14 experience. Three frogs are sitting on a log. How many are left on the log? Deciding to do something is not the same as doing it. With regard to creating personal success, making the decision to take action is a critical step in the creation process for success. But it’s not the same as taking the action itself. Success actions can include starting new things as well as stopping the things and habits that you need to stop doing to make room for the success that you desire. You must also keep doing the things that you are already doing that are helping to create success in your life. When you make a decision to create success you must follow it up with action. This weekend my daughter and second son will be competing in the National School Aerobics Championships on the Gold Coast. This will be the third year in a row that my daughter has participated in the championships and the first time for my son. While my daughter is in Year 6, my son is in Year 4. He is the only Year 4 in the team and the only male which is a terrific achievement. His involvement in the school aerobics team is part of the ripple effect of my daughter Sienna making the impossible possible back in 2012. In 2011 Sienna was in Year 3 and competed for the first time in her schools aerobics team. Sienna was in the school’s third ranked team. They did very well for a team of first timers but didn’t make the State Championships. The school’s number one ranked team not only won the State Championship but also went on to win the National Championship later that year. All the girls in that team were in Year 6. As a result of winning the National Championship, and despite the fact that all the girls who had participated in the team had graduated and moved on to high school, all the school’s aerobics team were promoted to a higher division for the 2012 season. While having our family dinner during the first week of school for 2012, Sienna said, “Dad, I’d love to be in the top team for aerobics this year, but it’s impossible!”. “Why is it impossible?”, I asked. We worked out that Sienna had six weeks between the conversation we were having and the date of the trials. “Sienna, let’s assume that it was possible for you to make the top ranked team this year. I know that it might be difficult, but let’s just pretend for a moment that it is possible. What do you think you would have to do to make the team?” I asked. “Well, I’d need to practice.” She replied. “How much practice would you need to do?” I inquired. “Probably every day”. (A good response!). “Okay, how long do you think you would need to practice?” I continued to probe. “Hmmm, maybe ten minutes?” (A great response from a nine-year old girl). “Maybe I could ask my teachers what sort of practice I should be doing?” Sienna suggested. “Excellent, that is a great idea. That way you’ll get the best value from your practice. Will you agree to do what you said you will do, at least that way you will give yourself a chance to make the top team.” I said. “Okay Dad, it’s a deal!” Sienna exclaimed. To Sienna’s credit she went and did what she said she would do. She asked her teachers what she should be practicing on and then she went and recruited two of her friends who had participated the previous year (they had also been in the third ranked team) to practice with her at recess and lunchtime. In reality she spent much more than ten minutes practicing each day, but it seemed more like fun than practice so she didn’t notice the ‘extra‘ work she was doing. In addition, what do you think happened when the teachers who were responsible for the team did when they were on yard duty? Yes, they came over and provided more coaching. This is called the Law of Attraction. Sienna’s teachers who were passionate about their teams couldn’t help but be attracted to the area of the playground where the girls were practicing. What do you think the Year Six girls were doing during this period? Were they training? No. When the trials eventually came in March what do you think happened? Not only did Sienna make the top ranked team, but so did her two friends! The impossible had become possible! What a wonderful life lesson! Despite having three of the team being in Year Four, the seven member squad became State Champions. They then went on to win a Silver Medal at the National Championships and they were the only team that included girls outside of Year Six. If Sienna had not been able to challenge her own mindset about what was possible, she never would have given herself a chance to make the impossible possible. There are no guarantees in life, but the willingness to focus on what you want to achieve, coupled by the desire to find out what work is required and to then go and do that work at least gives the impossible a chance to come true. Sienna’s National Silver medal was a bonus. In my eyes she was a winner the minute she started to put her promise into action and started training. How often do you let your view of the impossible stop you from giving yourself a chance to make whatever you want to have happen become possible? Focus on what you want to achieve, do your research and work out what you need to do to make it happen, and then go out and do it. At least you’ll be giving yourself a chance. Sienna’s success encouraged her younger brother to get involved in school aerobics. Due to his big sister’s experience he knew that it wasn’t impossible for him to make the top team. The ripple effect of Sienna’s willingness to maintain focus and to do the work required to create success is now into its third year. Irrespective of where the team places in the National Championships, the life lessons that they are learning highlights that they are already winners. In 1970 Robert K Greenleaf first published his essay, The Servant as Leader. This essay catalysed a world-wide movement for Servant Leadership. I was fortunate to have been exposed to the essay and many other resources associated with Servant Leadership from 1997. As such I have educated my clients about the power of being a Servant Leader ever since. Throughout the essay, Greenleaf references a set of characteristics that need to exist for a leader to be a true servant. In total there are ten characteristics and each of them are explained below. True leadership starts with the ability to listen for understanding. This is different to listening for argument. When you listen for understanding you are genuinely interested in understanding where the other is coming from. This does not mean that you have to agree with their perspective, just that you are genuinely interested in understanding it. When you listen for argument, you are listening from the perspective of finding holes in another’s arguments so that you can shoot them down. You are right and they are wrong. Period. A Servant Leader works hard at developing their skills so that they can listen for understanding. Listening for understanding enables leaders to have an increased capacity to relate to those with whom they are interacting. While they might not completely understand the perspective of the people they are working with (there are times when it is not genuine to say I Understand when your life experience is so different from the person’s with whom you are speaking), a Servant Leader has empathy for them and considers the serious impact of their decisions on the people they serve. Michele Hunt said that Leadership is a serious meddling in other people’s lives. Servant Leaders need to be able to both heal themselves and the people they work with. Organisational life can create emotional hurt for people and leader’s need to have the ability to help people resolve their relationships with colleagues, customers and the organisation itself. Often healing is represented by the leader treating all the people they come into contact with in a respectful way. Too many employees have not been respected because of their position in the organisational hierarchy. A Servant Leader treats all people with the same level of respect irrespective of their role. In doing so a Servant Leader helps the people they serve become more whole themselves as they build respect for themselves. Each of the ten characteristics of a Servant Leader is interdependent. A Servant Leader is self-aware, aware of what is happening for the people they serve and aware of what is happening outside their organisation. Being aware does not guarantee a sense of peace for a Servant Leader. In fact it is the opposite. Awareness means that the leader is sharply awake and keenly disturbed at the same time. Through awareness the Servant Leader knows that the world is a not a perfect place but that it can always be improved. The Servant Leader is able to persuade through genuine listening and dialogue. They use facts, the picture of the future they are creating with others and a clear and shared sense of purpose to help the people they serve to find and create the future they desire. Persuasion is not coercion. Positional authority is not the power that a Servant Leader uses to get their way. Instead a Servant Leader is able to influence those they serve through their genuine practice of the ten characteristics of a Servant Leader. A Servant Leader is able to communicate what possible futures look like. They have the ability to see beyond the day-to-day realities of organisational life to the possible future that they and the people they are serving are striving to create. Most importantly this characteristic is not one where the future they describe is the one that they dreamed by themselves, rather it is the possible future that they are able to articulate on behalf of the collective view that emerges over time. Foresight is the ability to see multiple consequences of both action and inaction. A Servant Leader is acutely aware of the ripple effect of errors of omission. They understand that they have an ethical responsibility to take action when they have the freedom to take action, even if that action is difficult. Organisations and institutions do not exist to make heroes of their leaders. Servant Leaders understand that they have a duty to serve their organisation so that it is in better hands for the next generation of leaders. The organisation and the institution are bigger than the leader. This mental model is essential if you wish to be a true Servant Leader. A Servant Leader aims to have the people they serve become more autonomous or at the very least not to be worse off as a result of their leadership. They strive to help people to find and develop their talents and celebrate in their success, even when this may mean (at times) those people leave the organisation. A Servant Leader is acutely aware that humans require a sense of belonging to help maintain their mental well-being. To this end Servant Leaders work at bringing people together and fostering a sense of community and understand that building community is created one person, one-act at a time. Servant Leadership is not confined to community, not-for-profit and government agencies. Quite the contrary. Many successful for profit organisations are explicit in their application of Servant Leadership. Three explicit examples include Vanguard, Southwest Airlines and TDIndustries. If you would like to explore how Servant Leadership can be introduced to your organisation please contact me here. Recent research by Mark McCrindle and his team has indicated that a current school leaver can expect to have 17 employers throughout their career. This equates to three different employers every decade. What some of you may find surprising is that the current data for people 45 years and older is that your job tenure average is six years and eight months. This means that more experienced people find themselves out looking for work more than ever. In this context, conscious development of your employability skills is not just for young people. It is also critical for more experienced people to continually develop your employability skills, given you will also be looking for work at least 1.5 times every decade (and that number is predicted to climb over the next decade). The challenge for those of you who are more experienced is that while you have experience, you haven’t consciously developed your employability skills. In fact, you are unlikely to know what they are! If you would like to learn about what employability skills are and how to capture stories that show how you have developed them (which is vital for successful interviews) you can download the first two chapters of my successful book What Really Matters For Young Professionals! for free here. The first chapter explains what employability skills are, and the second chapter teaches you how to capture examples of how you have developed them so that you can recall these stories in interviews. Once you understand how you have developed your employability skills it is critical that you keep developing them. Your reality is that as more and more people enter the job market with the same skills that you have, the key differentiator between you and someone else is not your skills but how well you have developed your employability skills. In fact, well-developed employability skills are much like a parachute for your career. 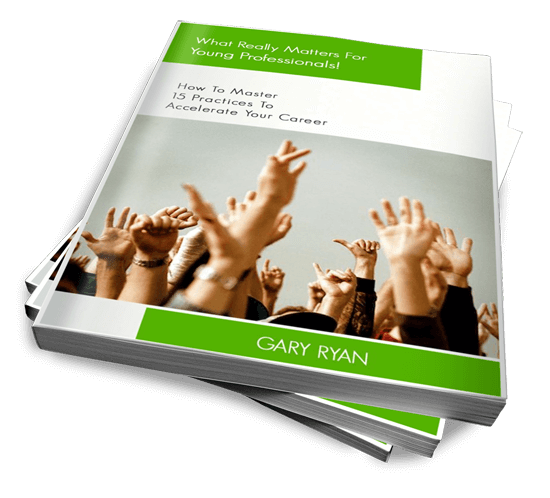 So check out the free chapters from my book and get moving on protecting your employability. Simon Sinek clearly articulates the power of purpose in his book Start With Why: How great leaders inspire everyone to take action . He explains that when you understand Why you do what you do, then you have more power to take actions that are consistent with living your purpose. When you start with why, people follow leaders for themselves. They do not follow leaders for their leaders. What is the purpose of our schools and universities? Do they exist to make money? Is that their purpose? Or do they exist to help children and adults learn how to learn so that they can contribute to creating a better world to live in? Imagine a school whose purpose was to make money. Business people would be invited on to the school board and no doubt astute business decisions would be made to make sure that the school did indeed make money. Intuitively, what do you think that school would be like to go to? Sure, there would be talented teachers there. But would a talented teacher be 100% engaged with the idea that what they were doing was first about making money? Yes they would receive a nice pay-cheque, but would that make that teacher fully engaged with why the school existed? What is your intuitive response to this scenario? Imagine, on the other hand, a school whose purpose was to help children to learn how to learn so that they could contribute to creating a better world. Imagine that same talented teacher working in that school. Intuitively, how engaged with the school do you imagine that teacher would be? Which of these two teachers would be more likely to go above and beyond the call of duty on a regular basis because of the purpose of their school? The one whose actions will help the school make more money, or the one whose actions will help children learn how to learn so that they can contribute to creating a better world? If you are reading that I am suggesting that business people should not be on school or university councils then that is not what I am suggesting. Schools and universities need to be rigorous in their financial practices and learn from the business community about how to make the best use of their money. But the reason for using business principles should always be in the context of serving the purpose of education. Education should not be used as the context for serving the purpose of making money. Schools and universities require soul and a sense of belonging. The purpose of education must always drive their use of business principles, else they risk serving the wrong purpose and will diminish the education experience of the children and adults they serve. Based on your experience, what is the purpose of your school or university? You can view Simon Sinek’s Ted Talk here.